Generate more traffic at your face-to-face events with a display that inspires engagement with your audience. Our Inspire 2.0 line of fabric display solutions offer cost conscious exhibitors an upscale aesthetic at a refreshingly competitive price. Now you can have a unique look from show to show or even day to day. Inspire 2.0 offer you two convertible canopy choices, flat or curved, each will convert into two different shapes for unique look every time. You get BIG graphic impact with Inspire 2.0’s new seamless SEG track and dye sub fabric graphic that delivers a crisp finish every time. Adding a second fabric graphic panel on the back side anytime you want to double your messaging and impact. That’s not all, Inspire 2.0 accommodates interchangeable accessories that mount easily to slimmer, sleeker 56.5 extrusions. Mix and match or rearrange them to suit your individual presentation requirements. Choose from a sleek selection of options including tablet mounts, monitors, counter pedestal and more. A more robust solution, Inspire 2.0 is designed to accept 25 to 30 lb. weight loads on each pedestal. 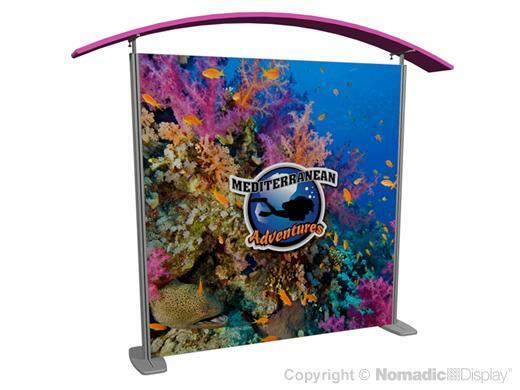 A 10’ Inspire 2.0 display – canopy with cover, seamless SEG printed fabric panel, set of lights and set of fins – packs in just one FlatPack 300 case that ships UPS. Additional accessories require a second case. Inspire 2.0 is a budget stretching solution because it’s scalable to expand or contract to serve multiple exhibit spaces. This 10' Inspire 2.0 tension fabric display connects to another to form an stunning 20’ inline.